Established: NABARD was established on 12th July 1982 on the recommendation of CRAFICARD committee which is also known as the Sivaraman Comittee. AIM To uplift Rural India & rural non-farm sector. NABARD acts as regulator for co-operative banks &RRB's (Regional Rural Banks). NABARD is the apex organisation related to financing in the agricultural sector. It looks after matters concerned with policy, planning and operations in rural areas in India. Rural Infrastructure Development Fund (RIDF) is operated by NABARD. Provides refinance to lending institutions in rural areas. Helps SHG (Self Help Group) & poor people in rural areas. Established: Small Industries Development Bank of India (SIDBI in short) was established on 2nd April 1990 under the Small Industries Development Bank of India Act 1989 as a subsidiary of Industrial Development Bank of India. SIDBI refinances loan & advances provided by the existing lending institution to small-scale units. SIDBI is an independent financial institution which provides help for the growth and development of micro, small and medium-scale enterprises (MSME’s). The second fund is a debt fund called SIDBI make in India loan for enterprises (SMILE), which was announced in the Union budget (2015) in February. The fund will provide short-term loans and loans in the nature of quasi-equity of MSMEs to meet debt-to-equity norms and pursue growth. Established: IRDDAI was set up in the year 1999 by the Insurance Regulatory and Development Authority Act, 1999, which was passed by the Government of India. The IRDAI is an autonomous, statutory agency tasked with regulating and promoting the insurance and re-insurance industries in India. Established: EXIM Bank was established on January 1, 1982 for the purpose of financing, facilitating and promoting foreign trade of India. The Export-Import (EXIM) Bank of India is the principal financial institution in India for coordinating the working of institutions engaged in financing export and import trade. Established: The bank started its operations from July 1988. National Housing Bank was established under section 6 of National Housing Bank Act (1987). The National Housing Bank (NHB), the apex institution of housing finance in India, was set up as wholly owned subsidiary of the Reserve Bank of India. Established: ECGC Ltd. was established on 30 July, 1957 to strengthen the export promotion by covering the risk of exporting on credit. Export Credit Guarantee Corporation of India. This organisation provides risk as well as insurance cover to the Indian exporters. Objective: Protects the interest of investors and to promote the development of stock exchange & regulate the activities of stock market. Brown: Principal at high risk. This regulation came into effect on 1 July 2013 post which all the fund houses have labelled their funds can be the basis of the risk levels. SEBI has launched a centralised web based system to redress complaints by SCORES. SEBI is the security market regulator in India. It is an autonomous apex statutory body to control & develop insurance agency in India. IRDA is a national agency of GOI. Passed by Government of India under IRDA Act 1999 on the recommendation of Malhotra Committee. Objective To protect the interest of policyholder, to regulate, promote & ensure orderly growth of the insurance industry & for matters connected there with or incidental there to. It was established in 1982 under EXIM Bank of India Act 1981. The bank lays special emphasis on extension of Lines of Credit (LOCs) to overseas entities, national govts., regional financial institution and Commercial Banks. The bank extends Buyers credit & suppliers credit to finance and promote country's exports. To promote hi-tech exports from India, the bank has a lending programme to finance Research & Development (R & D) activities of export-oriented companies. The authorised capital of the EXIM bank is Rs. 200 crore & paid up capital is Rs. 100 crore, wholly subscribed by the central government. To tap domestic & foreign markets for resources. undertaking development & financial activities in export sector (export & import). It is a company wholly owned by Government of India. ECGC provide insurance cover in respect of risks in export trade. ECGC Ltd. provides export credit insurance support to Indian export and is controlled by the Ministry of Commerce. ECGC Ltd. is the 7 largest credit insurer of the world in terms of courage of national exports. NPCI was incorporated in Dec 2008 & the certificate of commencement of business was issued in April 2009. NPCI was set up with the guidance & support of RBI& IBA (Indian Bank's Association). NPCI has successfully completed the major project of developing a domestic card payment network-Rupay. Presently, there are 10 crore promoter banks (SBI, PNB, BOB, BOI, Canara Bank, Union Bank of India, ICICI, HDFC, Citi Bank & HSBC). NPCI is umbrella organisation for all retail payments systems in India. It introduced UPI, USSD, BHIM App, Bharat QR CODE, IMPS, National Financial Switch, CTS, BBPS, Rupay, NACH, AEPS. It is a new payment service offered by the NPCI to banks, financial institutions using "Aadhar" number and online UIDAI authentication through their respective business correspondent service centres. RBI has approved the pilot of AEPS. 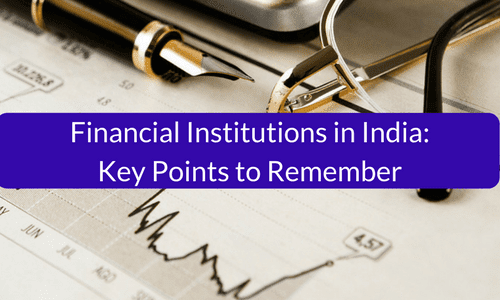 Indian Financial System Code is a code which is a kind of identity for a specific bank. It was initiated by Institute of Development & Research in Banking Technology and handed over to NPCI in 2009. NFS consists of a national switch to facilitate connectivity between banks switcher & their ATM's and interbank payment gateway for authentication and routing the payment details of various e-commerce transactions. NFS is India's largest ATM connecting facility. The main purpose of NFS initially was to include rural and co-operative banks under its umbrella. Established: Under DICGC act 1961 on 15 July 1978. 2. DICGC insures upto maximum Rs.100,000 for both principal & interest held by a customer as on date of scheme merger/reconstruction or cancellation of bank's license come into force (in case of multiple a/e still maximum insured amount is Rs. 1 lakh). NOTE: All commercial banks, branches of foreign banks functioning in India, RRBs, local area bank co-operative banks are insured by DICGC. GIC of India (GICRe) is the sole reinsurance company in the Indian insurance market. NOTE: GICRe becomes Ist reinsurer to open office at India's Ist international Financial Service Centre (IFSC) at Gujarat International Finance Tec-city (Gift city). The company was founded in 1956 under Life Insurance of India act on 19 June 1956. LIC is an Indian state owned insurance group and investment company head quarter in Mumbai. It is the largest insurance company in India. LIC's slogan yogakshemam vahamyaha is in Sanskrit language which translate in English as "your welfare is our responsibility". The slogan can be seen in the Logo, written in devanagri script. Slogan: Sampann Bharat ki Pehchan, Beemit Phasal Khushaal Kisan. AICIL was incorporated with an authorized capital of Rs. 1500 Cr. It offers yield-based and weather based crop insurance programs in almost 500 districts of India. It covers almost 20 million farmers, making it the biggest crop insurer in the world in number of farmers served. AICIL commenced business from 1st April 2003. AICIL is under the administrative control of Ministry of Finance, GOI and under the operational supervision of Ministry of Agriculture, GOI, IRDA, Hyderabad (India) is the regulatory body governing AICIL. Slogan: Haq, Ek Behtar Zindagi Ka. UTI is a financial organization in India, which was created by the UTI Act passed by the parliament of India on December 30, 1963 under the direction of Col. Akash Behl. CDSL holds securities either in certificated or uncertificated form, to enable book entry transfer of securities. It is the first & largest electronic securities depository of India. It has established a national infrastructure using international standards that handles most of the securities held & settled in dematerialised form in the Indian capital market. IDBI (Industrial development bank of India Ltd.) – Largest development Bank of India. UTI (Unit Trust of India) Largest mutual fund in India. NSE (National Stock Exchange of India Ltd.) - Largest stock exchange in India. NSDL also has a subsidiary company NSDL Database Management Ltd.
NSDL e-Governance Infrastructure Ltd. and the pension fund Regulatory and Development Authority (PFRDA) have entered into an agreement relating to setting up of a Central Recordkeeping Agency (CRA) for the National Payment System (NPS). The NPS was introduced by Govt. of India for its new recruiters (except the Armed Forces) joining w.e.f. 1 Jan 2004. NIBM is the RBI's fully owned subsidiary. It is an Indian Institution for research, training and consultancy in banking and finance. The campus is self-contained, with residential and educational facilities. It is registered as a society under societies registration Act 1860. It was established in 1969 by the RBI in the consultation with GOI as an autonomous "Apex institute" for the Indian Banking System. It is governed by a board, chaired by the Governor of Reserve Bank of India. The institute generates more than 70% of its own operating budget the rest is funded by the banking industry. It is a company registered under the companies act, 1956 with minimum net owned fund of Rs. 200 lakh engaged in the business of loans & advances, acquisition of shares/stocks/bonds/ debentures/securities issued by the government or local authority or other marketable securities like leasing, hire-purchase, insurance business, chit business. NBFC can't land more than 25000 in cash against gold. NBFC doesn't form part of the payment & settlement system and cannot issue cheques drawn on itself. NBFC with asset size of Rs. 500 crore are considered or more are considered systematically important NBFC. RBI wide notification released on 7-4-2014 has informed the concerned financial institution that non-operative financial holding companies (NOFHCs) will be a separate category of NBFCs. Promoter groups will be permitted to set up a new bank only through a wholly owned NOFHO which will hold the banks as well as all other financial services companies regulated by RBI or other financial sector regulators. NOFHC will be registered as non-deposit taking non-banking financial company (NBFC) with the Department of Non-Banking Supervision (DNBS) of the Reserve Bank. CERSAI is a central online mortgage registry of India which maintains all central registry of mortgages in India. It was primarily created to check mortgage frauds in which people took multiple loans on same assets from different banks. It was formed under (SARFAESI ACT-2002) and register under section 25 of companies act 1956. This is a government company with shareholding of 51% by central government and selected public sector banks & National Housing Bank are also shareholders. According to government directives, financial institutions must register a Banking and Economic Awareness mortgage within 30 days of its creation. It aims to help potential buyers by providing them proper history of the Asset and Lenders can assess data to check whether the same asset has been mortgaged with any other financial institution. It is set up to address specific problems relating to development in the rural areas. CAPART is an autonomous body registered under the Societies Registration Act 1860 and is functioning under the aegis of the Ministry of Rural Development, GOI. Today, this agency is a major promoter of rural development in India. To encourage, promote, assist voluntary action for the implementation of projects intending enhancement of rural prosperity and to make efforts in rural development with the help of new technology inputs. To promote, plan, undertake, develop maintain and support projects/schemes aimed at all-round development and create employment opportunities in rural areas. It was established by GOI on 23 Aug 2003. The Government has an executive order, mandate PFRDA to act as a regulator for the pension sector, PFRDA authorised by Ministry of Finance. PFRDA promotes old age income security by establishing, developing and regulating pension funds and protects the interest of subscribers to scheme of pension funds. It is responsible for the appointment of various intermediate agencies such as CRA (Central record keeping agency). It is a statutory body of GOI under the "Ministry of Labour & Employment". It administrates a compulsory contributory provident fund scheme, pension scheme and Insurance Scheme. On 1 Oct 2014 PM "Narendra Modi" launched universal account number of employees covered by EPFO to enable PF number portability. The Employees provident fund & miscellaneous provision Act, 1952 come into effect on 4 March 1952. The board is chaired by Union Labour Minister of India (The chief executive of the EPFO). EPFO act is not applicable in Jammu & Kashmir. BCSBI is an independent banking industry Agency that protects consumers of banking services in India. It is an independent and autonomous body, registered as a separate society under the Societies Registration Act 1860 on Feb 18, 2006. SS Tarapore came up an idea to form a committee for the benefit of customers so that they can get better financial services. IDRBT is also an academic institution that offers a range of academic & research programmes, designed specifically to meet both the existing and emerging requirements of the Banking and Financial sector in India. An export credit agency or investment insurance agency is a private or quasi-governmental institution that acts as an intermediary between national governments and exporters to issue export financing. The financing can take the form of credits or credit insurance and guarantees or both, depending on the mandate the ECA has been given by its government. EXIM Bank, ECGC (Export Credit Guarantee Corporation of India) are two export credit agencies of India. Export credit agency of CHINA has the highest capital. It is India's largest custodian and depository participant. SHCIL is known for its online trading portal with investors and traders. It also looks after e-stamping system around India. SHCIL has been appointed as point of presence (POP) by PFRDA for National Pension System (NPS). It offers full spectrum of NPS services and facilities to all citizens. SHCIL is only Central Record Keeping Agency (CRA) appointed by the government of India. NICL is the oldest insurance company of India which deals in non-life insurance business. It is 2nd largest non-life insurer as measured by gross direct written premiums (GDWP). NICL is wholly owned by govt. of India.